Results: 1 to 10 of a total of 310 results. Kuruk Me family be from the isle of ireland and we've had a few with scurvy. 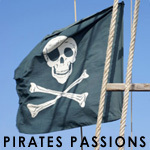 My family has allways had sailors and we respect the adventurers that pirates be.